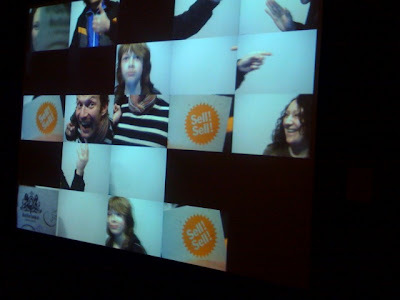 At the Design Museum currently is the Designs of the Year exhibition, among lots of excellent stuff is this interactive video wall designed by Ross Phillips for SHOWstudio. The idea is simple, and the execution is great fun - a touch screen allows to you select a frame, then a video camera records one second of you, which gets projected onto that frame on the video wall. The piece is actually called The Replenishing Body Kiosk and was developed for Evian by SHOWstudio, read their concept for it here. But, as ever with these kinds of things - the real fun is seeing what the public do with it - we watched kids make the whole thing go black, people pulling different funny faces into it, and course a LOT of 'hand signals'. And obviously we got in on the act by using it for a bit of shameless self-promotion. It's one way to get Sell! Sell! into the Design Museum. See more pics of it here.